Lease a new Bobcat® compact excavator from a participating dealer in the United States. With a lease, you’ll have fewer upfront costs, lower monthly payments and flexible contract terms. Plus, receive a free 2-year/2,000-hour full warranty*. Lease a new Bobcat® compact track loader from a participating dealer in the United States. With a lease, you’ll have fewer upfront costs, lower monthly payments and flexible contract terms. Plus, receive a free 2-year/2,000-hour full warranty*. Lease a new Bobcat® skid-steer loader from a participating dealer in the United States. With a lease, you’ll have fewer upfront costs, lower monthly payments and flexible contract terms. Plus, receive a 2-year/2,000-hour full warranty*. 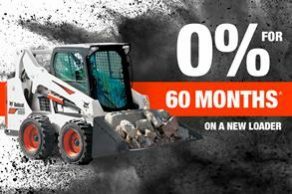 For a limited-time, you can finance Bobcat® skid-steer loaders at 0% for 60 Months* or take cash rebates up to $4,200 USD*. Plus, receive a free 2-year/2,000-hour full warranty*. Purchase a new Bobcat compact excavator from a participating dealer in the United States and receive 0% APR for up to 48 months* or in lieu of financing rebates up to $4,000 USD*. 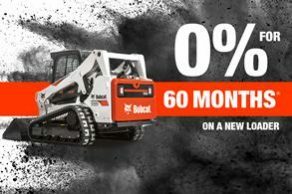 Purchase a new Bobcat utility vehicle from participating dealers in the United States and receive 0% APR for 48 months** OR in lieu of financing receive up to $500 USD** rebates. Receive 0% APR for up to 24 months* when you purchase a new Bobcat attachment from a participating Bobcat dealer in the United States. Purchase a new Bobcat all-wheel steer loader from a participating dealer in the United States and receive 0% APR for up to 48 months* or in lieu of financing rebates up to $2,600 USD*. Purchase a new Toolcat™ utility work machine from participating dealers in the United States and receive 0% APR for up to 24 months* or in lieu of financing rebates of $1,100 USD*. Purchase a new Bobcat mini track loader from a participating dealer in the United States and receive 0% APR for up to 24 months* or in lieu of financing rebates up to $400 USD*. Purchase a new VersaHANDLER® telescopic tool carrier from participating dealers in the United States and receive 0% APR for up to 24 months* or in lieu of financing rebates of $1,300 USD*. For a limited time, receive a 2-year*, up to 2,000* hour full warranty when you purchase select new Bobcat skid-steer loaders and compact track loaders from participating dealers in the United States. *Offer ends 09/30/2018. Available at participating and eligible dealers only. Offer may vary by product type, series, model and select units in dealer’s current inventory. Must take delivery from dealer stock by 09/30/2018. Offers available on new equipment in US and Canada only. Some restrictions apply. S70 excluded from warranty. Length of contract may vary. Prior purchases not eligible. See dealer for details. Financing provided on approval of credit by authorized Bobcat finance providers to well-qualified buyers. Administrative fees may apply. Offer not available to government accounts, national accounts and municipal/utility bid customers. Non-commercial customers may not be eligible for low rate financing. Bobcat Company reserves the right to extend or discontinue any of these programs at any time without prior notice. *Limited time offer. Available at participating and eligible dealers only. Offer may vary by product type, series, model and select units in dealer’s current inventory. Must take delivery from dealer stock by 12/31/2018. Offers available on new equipment in US and Canada only. Pricing does not include freight, prep or additional fees. Some restrictions apply. Length of contract may vary. Prior purchases not eligible. See dealer for details. Financing provided on approval of credit by authorized Bobcat finance providers to well-qualified buyers. Administrative fees may apply. Offer not available to government accounts, national accounts and municipal/utility bid and non-commercial customers. Non-commercial customers may not be eligible for low rate financing. Bobcat Company reserves the right to extend or discontinue any of these programs at any time without prior notice. **Limited time offer. Available at participating and eligible dealers only. Offer may vary by product type, series, model and select units in dealer’s current inventory. Must take delivery from dealer stock by 12/31/2018. Offers available on new equipment in US and Canada only. Some restrictions apply. Length of contract may vary. Prior purchases not eligible. See dealer for details. Financing provided on approval of credit by authorized Bobcat finance providers to well-qualified buyers. Administrative fees may apply. Offer not available to government accounts, national accounts and municipal/utility bid customers. Bobcat Company reserves the right to extend or discontinue any of these programs at any time without prior notice.